Kevin O'Callaghan - STEER FOR STUDENT ATHLETES INC.
Kevin became President and C.E.O. of Universal Builders Supply Inc. in 1991. He became Co-Owner in 1995 and Sole Owner in 2005. He worked for HRH Construction from 1983-85 as Project Manager/Superintendent and Hunter & Partners, NY as a Project Director 1985-86. ﻿Mr. 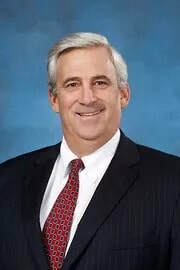 O’Callaghan is presently the Chairman of St. Vincent’s Catholic Medical Center Behavioral Health Services Westchester Advisory Council and President of The Hoisting And Scaffolding Trade Association of New York (HASTA). He is a Licensed Elevator Agency Director for New York Department of Buildings. Kevin is on the Board of Directors of the Building Trades Employers Association and the Young Presidents Organization (YPO) - Metro Chapter . He is Trustee of the New York District Council of Carpenters Benefit Funds (Excess of $5 Billion under Management). Kevin is an Honorary Usher at St. Patrick’s Cathedral and Lector/Eucharistic Minister and Catechist at Resurrection Church in Rye, NY. ﻿Under the ownership of the O’Callaghan’s, UBS has successfully maintained offices in the United Kingdom, Middle East, Venezuela, Chicago, Massachusetts, Connecticut, New Jersey, Philadelphia, Dallas, Syracuse, New Hampshire and Florida. ﻿World-renowned for creative solutions, UBS has worked on such notable projects as The Statue of Liberty, Trinity Church, Charlotte Stadium, Ellis Island, Perry’s Monument, London School of Economics, Madison Square Garden, Jefferson/Washington Monuments, Shea/Yankee & Citi Field Stadiums and Grand Central Terminal. UBS provided all the hoisting and scaffolding services for “the largest commercial building construction projects in the world” at Canary Wharf in London and the World Financial Center (Battery Park) in NYC. They completed AOL Time Warner Headquarters in New York (largest hoisting project in the history of New York City at the time) with state-of-the-art aluminum runback towers, the Republican National Convention Bridge (which spanned over Eighth Avenue in New York City), the Presidential Inauguration Platforms in Washington, D.C. (2001, 2005, 2009 & 2013) and the Swiss Re Project in the U.K.
UBS recently completed the scaffolding at St. Patrick's Cathedral and TheWashington Monument and is presently working at The US Capitol, Washington Union Station and Ground Zero Tower II along with numerous other projects in NYC and DC. ﻿Kevin was born in New Rochelle, NY and graduated from Trinity College, Hartford, CT.
﻿Kevin, his wife Meg and his three children, Kelly, Patrick & Jack have always been very active in many charities in the community.